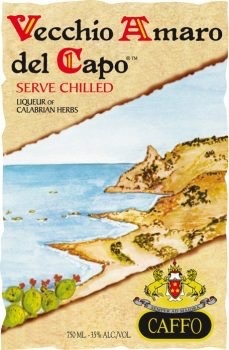 Spirits Caffo Vecchio Amaro del Capo - Royal Wine Merchants - Happy to Offer! This digestivo italiano is complex on the palate, revealing bittersweet flavors of orange, camomile, licorice, and juniper. Serve frozen or chilled, and see how the drink's expressions change and develop as the temperature rises. It's herbal aromatics begin to give way to warm fruity flavors and great acidity to balance. Vecchio Amaro del Capo is the flagship of the Fratelli Caffo Distillery. It is distilled from sugar beats, then macerated in 29 herbs, spices, roots, fruits, and flowers from Calabria.